I am a Cardiff based practicing lawyer of too many years to remember (hence the play on words blog title ) who has always had a passion for anything food or wine related. The purpose of this blog is to share my love of these thing and, sometimes (ok quite alot of the time), to have a bit of a moan. If I inform or entertain a few people on the way all the better. I should make it clear, I have no intention or desire to look at legal issues on the blog. I spend more than enough of my life on such thing already, so don’t expect any insight into legal issues from me on here. Any request for a legal view on something will be politely (not very) declined. I apologise in advance for any (the many) typos in my posts. I am a truly rubbish proof reader, it is all written on a phone (rather than a PC) and I have fat fingers!! I am also both dyslexic and dyspraxic and as a result sometimes (nearly always) miss the odd typo or 100 in my posts. Finally I can’t type for toffee. All photos on the blog have been taken by me on a crappy phone camera (as I am sure you can tell) and belong to me (except where specific permission of the copyright holder of an image has been obtained and this is acknowledged). Having covered IP law, in my long and varied legal career, I know all too well the implications of copyright breaches (be they inadvertent or otherwise). Easy money for lawyers! Please note the views as expressed on the blog are very much my own. 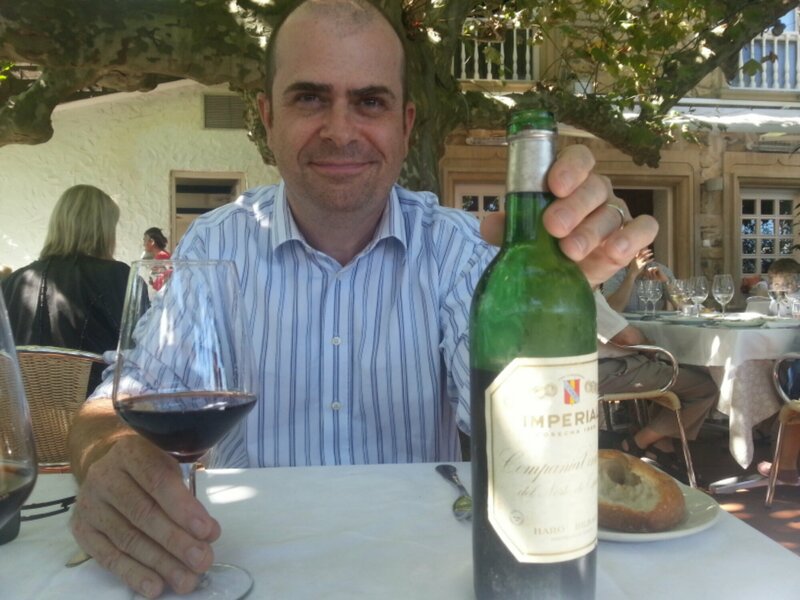 Me on a happy day at Rekondo , Donostia-San Sebastian with a bottle of 1968 CVNE Imperial. I am not very good at looking at either so don’t expect a rapid response. Twitter is probably best bet if want to get hold of me.